EVER wondered whether some car colours are safer than others? Few people in the market for a new car would have ‘colour’ amongst airbags and electronic stability programs on their list of desired safety features. 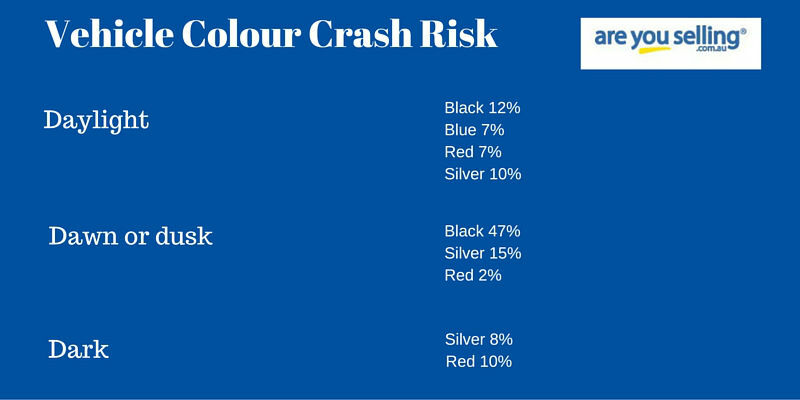 However there is a clear statistical relationship between a vehicle’s colour and its crash risk, particularly when light conditions are taken into consideration. Compared to white, colours such as black, blue, grey and others ranking lower on the visibility index were associated with higher crash risk in daylight hours – according to a 2007 report by Monash University Accident Research Centre. Although it may seem slightly absurd at first, there is actually a relationship between car colour and safety. The stats say many crashes are caused by drivers failing to see another vehicle, therefore less visible cars are slightly more at risk of being involved in an accident. Below shows the car colours with the highest relative risk (compared to white) at different times of day. White is the colour that is statistically the safest – hardly surprising considering that it is also the most visible on the road. Darker colours however, are the least visible during daylight – silver, blue, red and black are more likely to blend into the dark coloured roads. The link was reduced during darker driving hours due to colour being less distinguishable and headlights further reducing colour’s effects, as shown by the data above. The study also stipulates the colour of a car is nowhere near as influential a factor as driving behaviour. By driving within the speed limit, not driving after drinking and avoiding driving when tired, you increase your safety on the road. Is colour something you’ve taken into consideration when buying a car? Are there any colours you have difficulty seeing in certain conditions?